Okay, so I changed tops and threads but now I seem to be having an issue. I have TOWA gauge and tension checks out at 200 which is usually my machines happy spot, Tin Lizzy 18, but I am seeing the top thread on the bottom. I have adjusted the tension down to 170 up to 210 and get same result. Then I thought top tension so I tightened it and still same thing. Am I see this because its a variegated thread and a thinish batting? 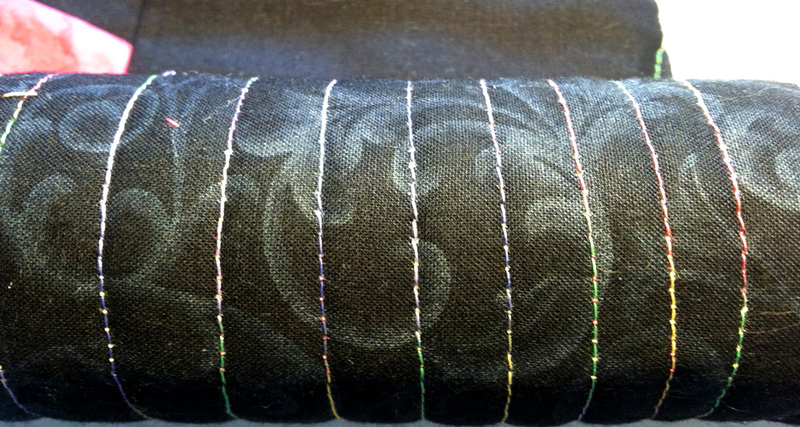 I have re-threaded my machine a few times as well as this is a new needle. It seems to me your bobbin tension is too tight, which is why the upper thread is unable to pull the bobbin thread up far enough. There could be lint underneath the bobbin spring (video shows you how to clean). Or, with the change of threads, you may need to follow Jamie Wallen's method of setting the bobbin thread as loose as possible first, then tightening the top tension. That is what worked for me. Thank you off to watch some youtube videos. I love Jamie Walensvideo, it has really help me! If what we are seeing is the bottom - to me your bottom tension is too tight (but with the towa at 170 it might not be) or your top tension too loose. Just one other thought - Rethread the top, new needle (right size for the thread if necessary) and check for "fuzz" in your tension assembly. If your tension disks are not closing correctly, it will not tighten the upper thread. Good luck - I just solved a similar problem but it was the top thread that was too tight! Took me awhile but it is fixed. Just takes patience.